Common Snakes of Florida: Florida, the sunshine state, is situation in the south-easterly part of the USA, with borders with the Gulf of Mexico, Alabama, Georgia, and even Cuba, to give you some idea of the kind of climate you can expect - hot and dry temperatures with the odd bout of severe thunder and rain storms, the perfect place for snakes to inhabit. Alongside Texas, Florida is home to the most species of snakes, around 50, although only 4 of those are known to be venomous. 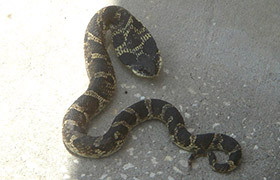 To identify the dangerous ones, click on the Venomous Snakes of Florida page. The humid weather that attracts these animals, over 170,000km of mangroves and salt marshes with underground and underwater sinkholes and caves providing the perfect hiding place. 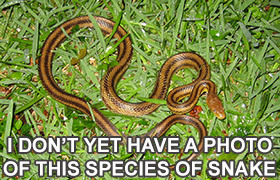 They’ll go wherever they can find food and many of the common snakes of Florida keep rodent numbers down. More people generally means more waste which in turn means more rats and mice and again, more snakes. Black Racer: Also known as the eastern racer or coluber constrictor, the black racer is a constrictor commonly found throughout the entire United States and even as far south as Mexico and Belize. If you spot a snake around your home, it could very well be this one, a big fan of suburban areas and rummaging around the neighborhood during daylight hours. 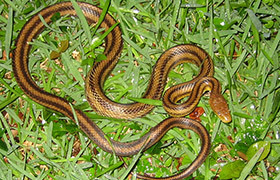 This is the most common snake found in residential Florida. Although not venomous, they will strike if threatened but when left to their own devices will hunt for lizards, frogs and rodents. They have a great sense of vision and are also very fast moving, commonly found among water if not around your home. Usually a dark color with a white chin-patch, there are also a number of sub-species of the black racer which have various color patterns, all of which sport a lighter underbelly with generally solid colors up top. These also lead to different names such as blue racers, brown racers, green racers, etc. and in some cases, the name ‘racer’ has been replaced with the name ‘runner’. Red and Yellow Rat Snake : Rat snakes (such as the yellow rat and red rat) are constrictors growing up to 10 feet in length. If you know a snake-fan, you’ll probably have come across a member of this family of snakes before - the corn snake. Despite being medium to large constrictors, they actually make for pretty docile pets. They’ll eat things like small birds and rodents, and within Florida you’ll probably find a yellow rat snake, a long and thin snake with a head that’s only a little bigger than its body. Although bites can happen if you get too close, they are usually minor and do not require medical attention. Rat snakes are not venomous snakes although they are still a pain, slithering into chicken coops to get to the eggs, earning them the nickname ‘chicken snake’. As well as Yellow rat snakes, Red Rat snakes, also called Corn snakes are commonly found in Florida. Garter Snake: The garter snake is often confused with ‘garden snake’ although this is a name mistake more than anything else. One of the most common snakes of Florida, you might spot these in highly populated areas, usually green or brown in colour with stripes of a pale colour running down the length of it. 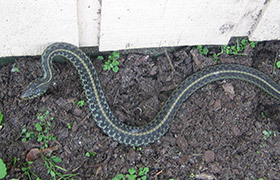 Just like many other snakes, colours and patterns of the garter snake will vary. Although one that enjoys habitats close to water, the garter snake is very adaptable and has learned to survive in areas not close to water, especially suburban regions. They can swim very well but because their prey consists mostly of worms, crickets, mealworms, slugs, birds and rodents, animals that can be found in many different places, they won’t be afraid to venture close to homes in order to feed. Unless you disturb them, the garter snake isn’t likely to strike and in fact are snakes often captured during hibernation for sale in the pet trade. Banded Water: There’s a good chance you won’t ever see the banded water snake, found in the most southern parts of North America. Usually a deep brown or red colour, they aren’t one of the biggest species you’ll come across, usually measuring in at just 40 inches or so in length. 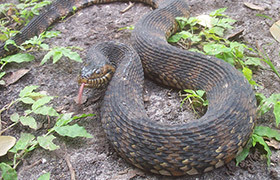 It’s another non-venomous snake but is often confused with one - the moccasin or cottonmouth snake. The banded water snake is a carnivore but won’t eat other species, making it happy living alongside others. Found in areas of freshwater such as marshes or lakes and although make for great pets because of their pretty docile nature, they aren’t very attractive therefore aren’t in high demand. Although they will quite happily eat rats found in suburban areas, they much prefer water-dwelling prey such as frogs, small fish, tadpoles, crayfish and even salamanders and newts. Eastern Hognose: Found in sandy and relatively dry places, you’ll find the eastern hognose snake in turkey oaks or scrubs, a relatively ‘thick’ snake with a larger head and a nose or snout that points up towards the tip earning it the hognose name. This nose is perfectly shaped for digging soft soil and sands. A snake that has a particular taste for amphibians such as toads and frogs, they will also eat salamanders and other water-dwelling creatures, another common place you’ll find it. This is a snake that can come in many colors ranging from completely black to brown, gray, dark red, yellow and even combinations of these. Although not technically a venomous snake, the mild venom released during a bite can cause a blister-like swelling, but the bite and venom itself will not cause threat to human life. Scarlet King: This snake is not venomous but is often confused with the coral snake, a species that is very venomous to humans. The good news is that a scarlet king snake will not attack unless seriously threatened / cornered. 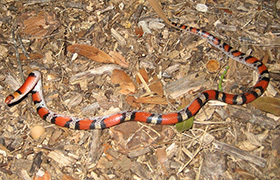 They will much prefer to slither away than face confrontation, but because of their yellow, red and black banding which appears very similar to the dangerous coral snake, they’ve earned a frightening reputation. Florida Pine: This is a snake known by many other names and just a few you might have encountered are - bull snake, black and white snake, common pine snake, chicken snake, eastern bull snake and even white gopher snake. With a tall and pointed head and red / brown / black blocks of color over a lighter shade, they can look pretty intimidating, growing to between 4 and 8.3 feet in length but are harmless and non-venomous. It will attack if threatened but before it does so, it will flatten its head, hiss loudly and vibrate the tail to warn you off. 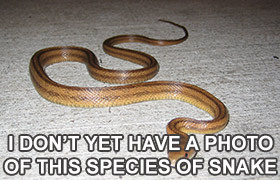 This is a generally docile snake unless seriously threatened. The pine snake’s habitat includes open brushland, pine flatwoods, cultivated fields, prairies and rocky deserts, but they have been known to live underground, using gopher tunnels. The pine snake eats gophers but it will also eat lizards, non-flying birds, and other small mammals. Eastern Indigo: A snake often confused with the black racer, the eastern indigo snake is actually one of the largest of the common snakes in Florida, measuring it at a hefty 8 feet maximum, males being longer than females. 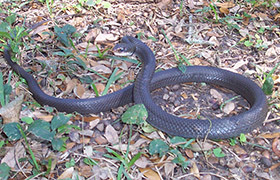 Another dark colored snake, it is usually iridescent (often looking purple or blue) and has a contrasting colored throat, usually white or red. You’ll usually find this snake in dry places such as the sandhill plants (that’s why they love Florida) and you can also find them around dry glades, areas of well-drained soils and flatwoods. There are a number of common snakes of Florida and just a few more you are likely to encounter include the Ringneck, Brown Water and Florida King. Click here for a list of venomous snakes of Florida. For more information, go to my Snake Removal - How to Get Rid of Snakes home page.